It is amazing how far technology has come in just a few years. Not too long ago, if a homeschooling parent was struggling to teach a subject to their children the only option was an outside tutor. Getting a tutor for your child does have its advantages. However, it can be expensive and you are locked into a limited amount of study time with a tutor. But now, technology is such in that help can come in many forms. This past month I reviewed ALEKS as part of The Old Schoolhouse Crew. ALEKS stands for Assessment and Learning in Knowledge Spaces. It is a web-based, artificially intelligent assessment and learning system. Through an assessment test, the program determines exactly what a student knows and doesn’t know in a math course. It then offers individualized instruction that meets the student at his learning level. So in other words, ALEKS is like a personal tutor but with so much more. 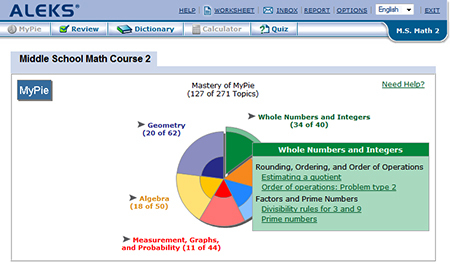 ALEKS offers comprehensive courses from elementary school math to complex subjects such as PreCalculus. Because all you need is a computer with internet access, it is a very flexible solution for busy students. I registered Aaron (8th grade) and Abigail (6th) grade for ALEKS. Here is how it worked. Each child took an assessment test that lasted about an hour. 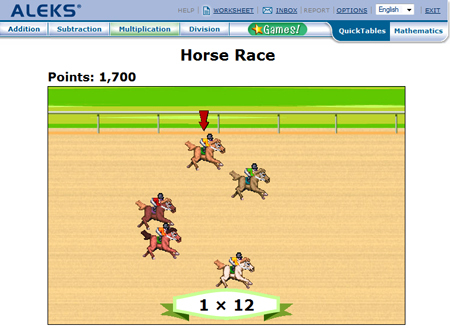 ALEKS avoids multiple-choice questions and instead uses input tools that mimic what would be done with paper and pencil. Each test asked around 30 questions. When the test is complete, ALEKS has developed a precise picture of their knowledge of the course. We know what topics each child has mastered and which ones have not yet been mastered. Each child’s knowledge is represented by a multicolor pie chart. The light areas show the topics that need to be learned with the dark areas representing what is already mastered. This is where the learning comes in. Each time the child logs on; they are offered a choice of topics they are ready to learn. They are then given practice problems that teach each topic. As new principles are learned the dark areas on the pie chart begin to fill up. This is encouraging for the students to see how much they are learning. The progress reports are encouraging for the parent. For the younger grades they offer QuickTables. It is a mastery program for multiplication, division, addition, and subtraction. Abigail enjoyed using it as well as the fun games that come with it. While I really like ALEKS, we will not continue it this year. However, I can see purchasing it in the future as the children get older and math becomes harder to teach. It could be very valuable those last few years of high school. The online program is $19.95 per student per month. They also offer family discounts on their website. 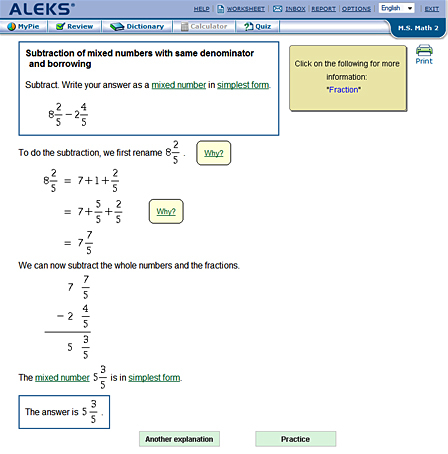 If you are interested in ALEKS check out their site for a free trial. To learn what others are saying about ALEKS click here. Disclaimer: As a member of The Old Schoolhouse 2010-2011 Crew, I received a trail version of ALEKS in exchange for an honest product review. I do not receive any other form of compensation for the reviews posted on this blog.